Two authoritative surveys of senior corporate leaders on the outlook for 2019 put cyber risk at the top of their list of worries, right up there with recession and climate disasters. The relentless pace of embarrassing and costly data breaches and malware takeovers in recent years clearly are driving cybersecurity up the agenda–at least, the good news is that business leadership (and their regulators) are fed up and demanding an end to the cycle. Boards and upper management increasingly must know their financial exposure to cyber risk, and that in turn is driving security teams to the FAIR model, the international standard for cyber risk quantification, and the engine for the RiskLens Cyber Risk Quantification platform. Here are some of the grim details from the surveys, released this week. 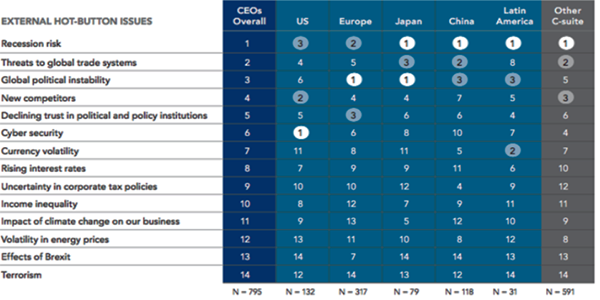 Interestingly, that’s a wide divergence from international CEOs in the survey who ranked cyber risk far down their lists, topped by Recession – for Chinese executives, infosecurity only made it to #10. The World Economic Forum, organizer of the famed Davos Conference of 1,000 chief executives in Switzerland every January, surveyed its members and found their risk lists (for the world, not just their companies) mostly centered around weather and cyber. 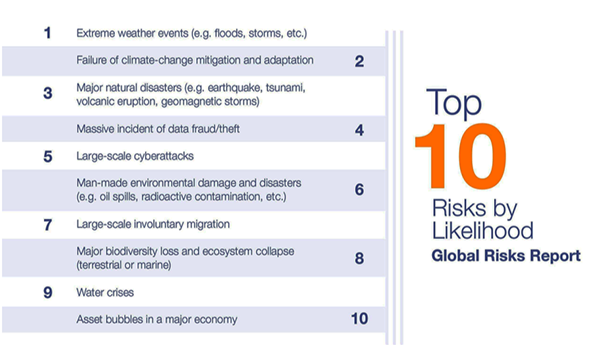 The Top 10 Risks by Likelihood begins with three climate/natural disaster risks, then names “Massive incident of data fraud/theft at #4 and “Large scale cyber attacks” at #5. 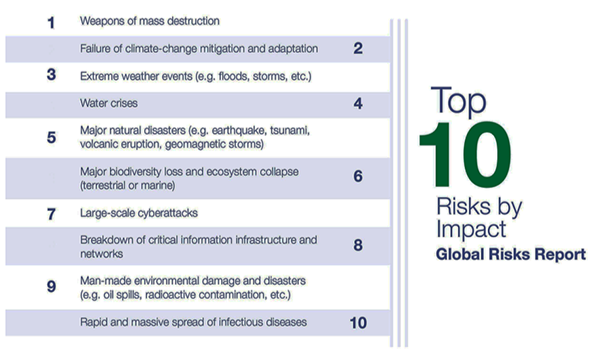 The Top 10 Risks by Impact placed “Large scale cyber attacks” at #7 and “Breakdown of critical information infrastructure and networks” at #8. Eighty-two percent of the chief executives surveyed expect the risk of cyber attacks leading to theft of money and data to increase in 2019, with 80% believing cyber incidents would disrupt operations. In a world of increasingly serious cyber and operational risks, corporate managers look to the RiskLens Cyber Risk Quantification platform for guidance on prioritizing and effectively responding to key risks based on solid financial analysis. Contact us to learn more.